Creativity and collaboration is easily sparked when given more room to ideate. Today we are beginning to hear a lot about glances, glimpses and micromoments. These are the very varied and short interactions that technology like smartwatches bring us. They are intimate, small scale, up close and personal, and all about the surfacing of small pieces of information. At the other end of the scale is being immersed in your information. Where it’s about being part of that space and exploring it. Where you are working at a human, physical scale, rather than viewing the digital world through a keyhole. These immersive digital environments are created through multiple or massive displays and Virtual Reality. They are the sort of thing you’ve probably experienced via the teleconference room, or the Network Operations Center or maybe even your organization’s “insight room”. These places enable us to inhabit them, walk around, touch, point and explore. When we think of analysis we often focus on the analyst. The single person locked into their PC, crunching away at the data in isolation. In a way the traditional PC or laptop forces that. It traps us in the two foot zone of you and your screen. But when we do other forms of thinking we tend to want to and are even encouraged to break free. We create ‘war rooms’, we use whiteboards, perhaps we even go for a walk. IN fact, a recent study from Stanford found that walking improves creativity and suggests that “a person’s creative output increased by an average of 60 percent when walking”. When we want to think creatively we need to break out of our confinement. We need room to think. The ‘endless canvas’ has long been a popular metaphor in software, a space where you can lay up an ‘infinite’ number of items that can be viewed and perused. It’s an idea that reflects how we like to solve problems. We take the information we have and lay it out so that we can see it. It makes the most of our amazing visual analysis skills. This helps us to draw connections and tease out meaning. It’s our preferred behavior. So much so that wall space is often the most sought after resource in creative workplaces. In addition, it’s also how we work most effectively with others. We need spaces that we can gather in and be ‘present’ in. Where we are immersed together, telling stories, debating and pointing to artifacts. It’s why the workshop, brainstorm and conversation are so much more productive than the emailed report. Give yourself a little more room to innovate in your organization: it could lead to better results! Working at different scales and on a variety screens influences how we experience data and information. The way we behave also changes as it reflects what we are comfortable doing in that space, in that context. This doesn’t change the analytic facts, but can change how we communicate them, how willing we are to explore or question them, or even how much trust we place in them. 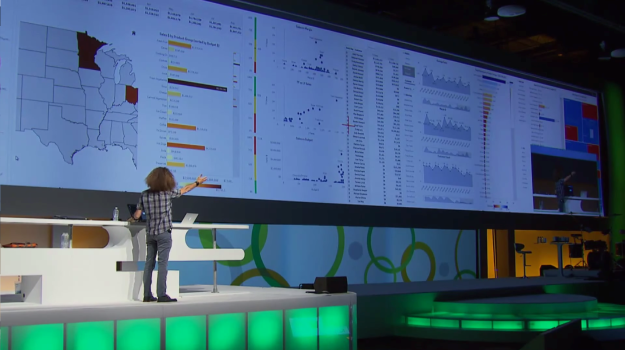 So if you’re lucky enough to have an insight room at your organization or space with several large screens, take Qlik Sense for a spin in it. Thanks to the responsive design and the ability to use multiple browser tabs, it’s great for working collaboratively at scale, both up close and at a distance. Let me know what you experience. Did it effect the way you worked, the way stories were told and debated, or even how the decisions that were made and recalled? 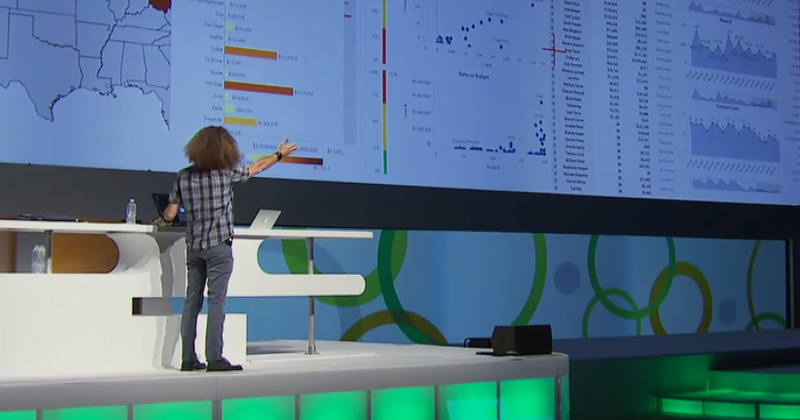 For more perspective, here’s a glimpse of Qlik Sense at scale: http://global.qlik.com/us/blog/posts/mark-bilotta/what-is-the-future-of-the-office. Qlik’s Innovation & Design team is running a survey to better understand how people feel about making business decisions and would value your input. The survey can be found at https://www.surveymonkey.com/s/qlikdecisions.